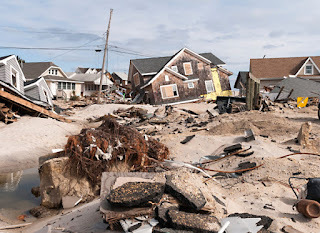 Anthony Zarrilli, owner of Zarrilli Homes in Brick, NJ, not only help rebuild homes devastated by Hurricane Sandy, his own offices and showrooms were destroyed as well. With the help of Excel Modular Homes in Liverpool, PA he began rebuilding homes for neighbors and friends. One of his clients shot footage before and after the storm hit, then gave a tour of his small cottage that was flooded, the demolition and the set of his modular home he designed and built with Zarrilli Homes. "Our family built a small beach house in Lavallette, NJ 1n 1948. It was a nice little house, filled with memories, until Superstorm Sandy ruined it. This video is about how the storm affected our community and our house. It's also about demolishing and rebuilding after a natural disaster." Driving through the area now you can still see remnants of the destruction but hard work by the thousands of people that tirelessly struggled to bring the area back to life is quite evident today. Many modular home builders throughout the state and factories quickly supplied the residents with new homes. This video is dedicated to all of them. Here is a video that will take you back to those terrible events from Superstorm Sandy.